Three U.S. Air Force members are washed away by high waves, with one found dead and the other two still missing. TOKYO – A powerful typhoon lashed southern Japan on Sunday, churning up high waves that washed three American airmen out to sea and killed at least one before taking aim at Tokyo. Elsewhere in the Pacific, a separate typhoon whipped the Mariana Islands, including Guam, with high winds and heavy rain. By late Sunday, Typhoon Phanfone was off the coast of Shikoku in southwestern Japan, with winds of up to 90 miles per hour after hitting the regions of Okinawa and Kyushu, Japan’s Meteorological Agency said. One of the three airmen was found dead. The other two were missing, according to the Air Force and the Japanese coast guard. They had been on Okinawa island’s northern coast when they were overcome by the waves, according to Tsuguyoshi Miyagi of the coast guard’s Okinawa branch. The Air Force said the search for the missing airmen had been interrupted by rough seas. Their names were being withheld pending notification of relatives. Okinawa is home to about half of the roughly 50,000 American troops stationed in Japan. Several people on Kyushu island were injured in the typhoon. The storm also grounded more than 100 flights Sunday and knocked out power to more than 9,500 Kyushu homes. In Suzuka, in central Japan, a French driver was severely injured following an accident in the Japanese Grand Prix that had to be shortened because the heavy rain made conditions too dangerous. Formula One driver Jules Bianchi of the Marussia team went off the track at a turn and hit a recovery vehicle that was removing a car that had crashed earlier. An unconscious Bianchi was taken to a nearby hospital, where he underwent emergency surgery for a severe head injury. Race officials said he was in critical condition. The storm triggered concern about possible landslides on the ash-covered volcano in central Japan that erupted Sept. 27 and killed at least 51 hikers. The search for a dozen people missing in the eruption was suspended Sunday because of the storm. 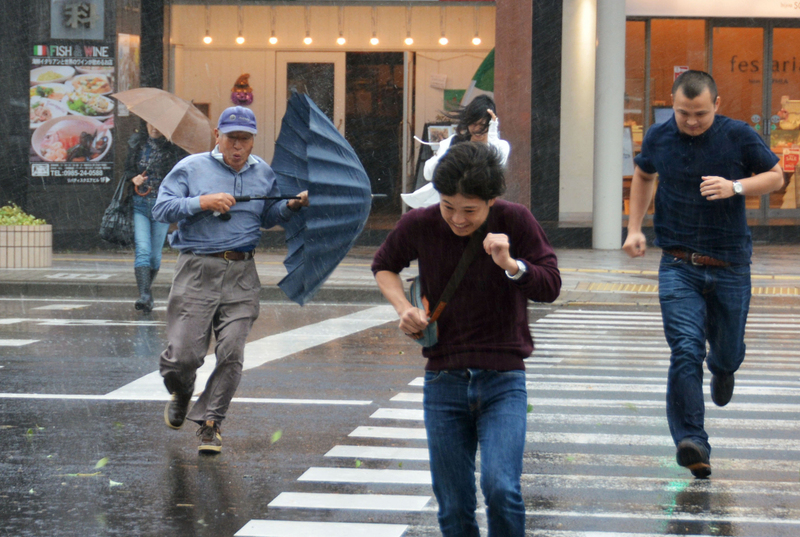 The meteorological agency predicted that up to 16 inches of rain could fall in central Japan by Monday morning. The eye of the typhoon in the Marianas was expected to pass over the small island of Rota, which has about 2,500 residents. Typhoon Vongfong had maximum sustained winds estimated at 105 mph, said Roger Edson of the National Weather Service in Guam.